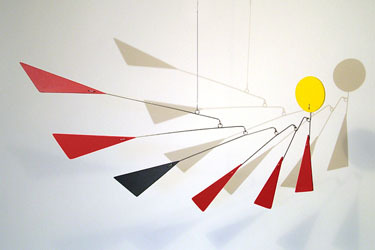 This mobile design is long and narrow in height, a horizontal shape, good for rooms with lower ceilings. It has great points that look magically balanced. I even have a mobile like this outside my window. The wind tosses it but tangles very little. I love watching it turn and balance. Watch a video of Aerial Mobile in motion!